"TV Favorites MEGAPACK 100 Episodes"
I have the series names, but not season number, episode number, and almost no titles. I decided to try FileBot to see if it helps identify. So far, I have not found any matches. I am not sure how it figures out the possible match. Maybe I do not have enough information to do this or just am doing something wrong. Any help is appreciated, thank you in advance! Without SxE numbers nor episode titles, how would a human or a program identify the files? Excellent question . . . FileBot was somehow matching up files to SxE although seemed to incorrect and not just sequentially. I have been able to identify a small percentage by watching the first few minutes and the episode showing the episode title. If the file path has no identifying information, then the matches FileBot will come up with are effectively random noise. In this case, you'll have to manually align files and episodes as show in the video tutorial above. cant find any sources ? 2. "...watching the first few minutes and the episode showing the episode title." 4. maybe the file hash search can help ? rednoah: I was wondering if it was basically random noise or if it was doing something else such as length of the episode (although realizing that most of them are really close to the same length). kim: I have found others selling the collection, but I have not been able to find the sXe or titles yet. The source is strictly from the DVDs that I have and it appears the distributor might be out of business (TreelineFilms.com), so I cannot ask them. I may have to try filesize or hash, but this seems like somewhat random depending on how the DVD was created as well as how the files are extracted . . . unless I am not understanding something. I sure appreciate the comments. At this point, example paths and screenshots would allow us to see what exactly you're dealing with, and confirm if - or if not - FileBot can help you bring order to the chaos. 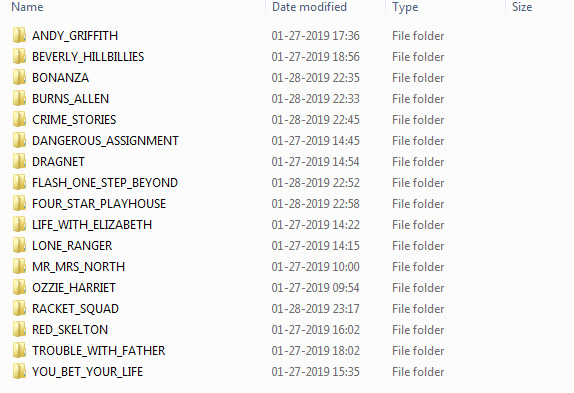 I did name folders according to the series name, so at least have that benefit. rednoah: I will take a look at the link and attached screenshots, etc. later. As mentioned, the directory and files are shown on Windows through a samba share on CentOS. FileBot is running through a docker container (using docker-compose) on the same CentOS machine. 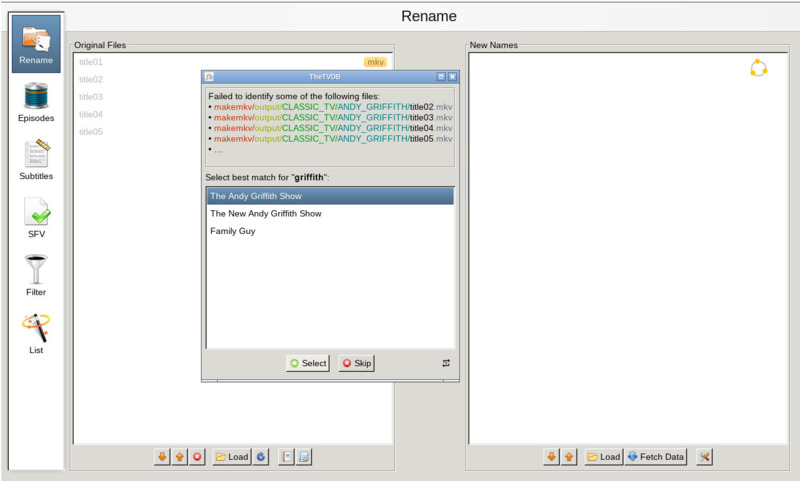 The end result of the path to where the files is located: "~/makemkv/output/CLASSIC_TV/ANDY_GRIFFITH". I used Andy Griffith for my test because I have the series already backed up and can verify that way. Did I get everything covered? Do title01/02/03 refer to Episode 01/02/03? No, I do not know the season or episode numbers. I do not even know the episode title. That is why I am trying to figure out a way to find them. I have been able to identify the small number of the 100 episodes that have a title in the first few minutes. I was wondering how FileBot was attempting to do a match as well or if it was truly random noise. Sorry, in this case FileBot has no possibly way of identify the files. Looking at the screenshot, it seems the number in the filename matches either episode number or season number, which is meaningless in this particular case. I did not notice that, thank you. I will continue to try to find out more information so that I can name them properly. I appreciate all your help! Found a way to identify the episodes which is proving to be accurate. Search a guest on the show. If they are on a bunch, try another guest, and sometimes still watch part of it to narrow down further. Not a terribly fast process, but it works. Thank you both again for your help.